With a Square LED Screen, You can see Time, Speed, Distance and Calories burnt. Adjustable speed control from main console. Speed can be adjusted to 1-10 km per hour. Durable handrail, flywheel cover and adjustable running belt. Foldable treadmill – great for storage. Why spend £££’s at the gym when you can have your own treadmill at home! Our fantastic home treadmill will help you get fit and lose weight without taking over your living room! Foldable for easy storage, it can be put away when you’re not exercising and taken out when you are. Made from high quality durable materials, this Treadmill is excellent value for money and will be a great addition to your home workout routine. •With a Square LED Sreen, You can see Time, Speed, Distance and Calories burnt. •Adjustable speed control from main console. •Speed can be adjusted to 1-10 km per hour. •The emergency stop switch will help you to stop in case that you fall down on the running belt. 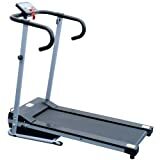 •Foldable treadmill – great for storage. •Durable handrail, flywheel cover and adjustable running belt. •This treadmill will provide you with several benefits. It will improve your physical fitness, tone your muscles and, in conjunction with a calorie-controlled diet, help you lose weight. •Suitable for home use only. •Braking ability is dependent on speed. •The belt can be cleaned with water and mild soap but be sure to remove any excess water after cleaning. •3 Built in workout programs: P1, P2, P3.